Today in Busan, South Korea, Pacific nations came together and agreed, for the first time, to recover the population of Pacific bluefin tuna to a sustainable level. Bluefin tuna at auction in Tokyo’s Tsukiji Market. 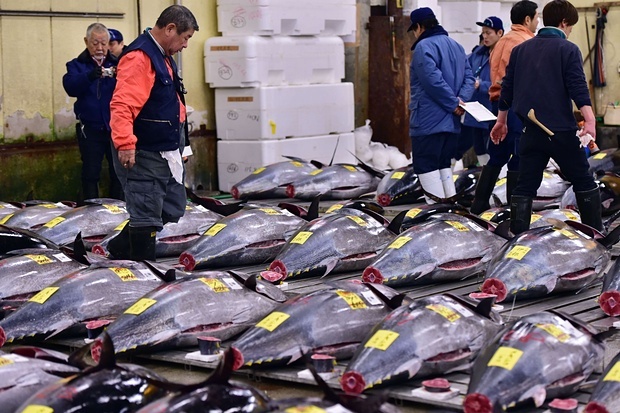 Japan consumes 90 percent of the world;s catch of bluefin tuna. Photo courtesy Associated Press. “This is a historic moment for this remarkable species, which is so important to the ocean ecosystem and to coastal communities around the Pacific Rim,” said Margaret Spring, Chief Conservation Officer for the Monterey Bay Aquarium. At the annual meeting of the Northern Committee of the Western and Central Pacific Fisheries Commission—the body responsible for managing tunas and other highly migratory species across the western Pacific Ocean—international delegates discussed ways to recover the population of Pacific bluefin tuna after years of decline. Ultimately, they took a major step forward by agreeing to recover the population to a sustainable level and establishing a long-term management plan. 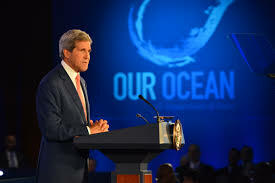 John Kerry has been an ocean advocate, in Congress and as Secretary of State. “Of all the environmental progress achieved in recent years, it is particularly important that the one direct line that so many, from a wide variety of different backgrounds and ideologies, have drawn is between the fate of our oceans and our existence, our economic well-being, and the diversity of human cultures around the world. Whether it’s through the U.N. Sustainable Development Goals or the Our Ocean Conferences, which I founded as Secretary of State, or through groundbreaking work in corporations and philanthropies, together the international community has elevated the centrality of the oceans to our global responsibilities.